When Richard Chavez polishes a stone, he walks into the bright New Mexico sun to check his work. The natural light allows him to see imperfections that would be invisible in the lights of his studio. Always a perfectionist, Chavez may take several steps in and out of the studio door until a stone is polished to his satisfaction. A fastidious lapidary artist, Chavez has been working with a selection of quality stones since the mid-1970s. Today he is recognized as one of the leading Southwestern lapidary artists. Chavez’s work is characterized by clean lines, fine polishing, attention to detail, and reflects his architectural background, which was his first career. While working for the architectural firm of Harvey S. Hoshour, Chavez became familiar with and began to apply the principles of “less is more” pioneered by Bauhaus modernist architect Ludwig Mies van der Rohe. These same principles are apparent in the jewelry Chavez creates today. BRACELET of fossilized walrus ivory, turquoise, coral, black jade, and silver, 3.2 centimeters wide, 2012. Private Collection. His jewelry is strikingly different from that of other Southwestern artists. The color palette he chooses relies strongly on either a predominant dark background of black jade or lapis lazuli or a light background of fossilized ivory; and generally, he incorporates turquoise and coral—both thought to be traditional Southwestern materials—only as accents. Like many of his colleagues who began careers in the 1970s, Chavez was influenced by the groundbreaking work of jeweler Charles Loloma (Hopi, 1921-1991), who was also known for his use of atypical stones set in innovative designs. Like Loloma, Chavez distinguished his jewelry beginning in the 1970s by including stones that were thought to be nontraditional. The stones can include Siberian green jade, black jade, tiger’s eye, fossilized ivory, opal, lapis lazuli, sugilite, chrysoprase, and occasionally agates of particularly striking colors. Chavez was born in 1949 and grew up in the conservative village of San Felipe Pueblo. Educational goals were important to his parents, which led Chavez to pursue a career in architecture. Initially, he trained as an architectural draftsman though a program at Draughon’s Business College in Dallas and later, while working for Hoshour, he took architecture classes at the University of New Mexico. He began making jewelry while working at Hoshour’s firm to supplement his income. Initially, Chavez made heishi beads from olivella shells or he hand-fashioned turquoise beads. But as the lower-priced heishi beads imported from Asia undersold his handmade work, Chavez began to look for other options. He noticed that some other Southwestern jewelers were creating intriguing designs in silver and he decided to try his hand at metalwork. LAPIS LAZULI EARRINGS of coral, turquoise and fourteen karat gold, 4.1 centimeters long, 1992. Private Collection. BLACK JADE EARRINGS of coral, turquoise and eighteen karat gold, 3.2 centimeters long, 2003-2004. Collection of Joan Borinstein. SIBERIAN GREEN JADE EARRINGS of coral, turquoise and silver, 3.2 centimeters long, 2009. Collection of Carole Katz. Within a few short years after transitioning from heishi beads to metal jewelry with inset stones, Chavez began to receive recognition for his innovative designs. He won the Best of Show Award at Eight Northern Pueblos Show in 1976, the first year he participated in the event. That same year, he also sold at the Southwestern Association for Indian Arts (SWAIA) Market in Santa Fe. In 1977, the second year he entered the SWAIA Market, he was awarded a first place ribbon, and in 1981 received a SWAIA Fellowship during the second year it was offered to artists. Chavez used the fellowship funds to purchase gold, which was a more expensive metal than silver, and as funds allowed, he utilized it with more frequency as part of his jewelry. During this pivotal period and at the forefront of change in Southwestern wearable art, he and a few other artists were transforming Southwestern jewelry from classic silver and turquoise forms to those that featured gold, innovative shapes and a variety of stones. The materials as well as the designs they created blazed new trails in Native aesthetics. BRACELET of Sea of Japan coral, turquoise and silver, 2012. Collection of Mike and Gene Waddell. SWAIA—the organization that produces the largest leading Native American art market in the U.S.—had another major impact on Chavez’s jewelry. In the 1970s-80s, SWAIA rules required that jewelers use all natural materials. Chavez preferred onyx rather than jet for a black stone because jet is a soft stone and he wanted a stone that was more scratch resistant. Realizing that onyx is dyed to achieve the black color, and as such was not a natural stone, Chavez began to look for alternatives. In 1988, he tried black jade for the first time and found the stone to be one that was suitably hard and took a polish well. Always fond of the deep blue of lapis lazuli, black jade offered Chavez an alternative dark stone choice. Chavez also found that black jade, which in the U.S. often comes from Wyoming or Northern California, is readily available in an unpolished form. Stone selection is an important part of the work of a lapidarist and Chavez purchases many of his stones at the gem and mineral shows held in Tucson or Denver. Materials are sold by weight and, of course, the stones look much different in their raw, unpolished states. When lapidarists cut into one, they might find that only a portion is of suitable quality. Much of the raw material can be discarded while cutting, shaping and polishing. Artists are taking a chance each time they purchase raw materials. NECKLACE of lapis lazuli, coral, turquoise, and silver, 22.9 centimeters long, 1992. Private Collection. Adjacent are preparatory drawings of works; one containing the necklace shown here. Chavez sketches all of his pieces to scale and on the final drawing will add notes about materials and dimensions. He has kept many of the drawings to record the development of his career over time. BOLO TIE of fossilized ivory, coral, black jade, turquoise, and fourteen karat gold, 8.3 x 5.4 centimeters, 1998. Private Collection. When he first began working with metals, Chavez thought about the designs he wanted to make and worked directly with the stones and metals to create each item. Within a few short years, he began to draw preparatory sketches of jewelry designs—initially on lined note paper but more often on graph paper—and has continued this process, drawing all of his works to scale. For some pieces, Chavez may draw a series of designs on different pages of paper until he is satisfied; and on the final drawing, he’ll typically add notes about materials and also include dimensions. He has retained many of these drawings, which as a body of work illustrates the progression of his career through time. Chavez’s interest in architecture has continued to influence his jewelry designs and he often photographs architectural features when he travels. The rings in particular evince architectural motifs—a building’s cornice may be inspiration for the lines of a ring or the corner of a building reflected in an angle or influence its height. Some have flat planes that rise above the hand, much like a structure rising from the ground. Several examples contain a different design on each side. The circular forms of building ductwork might appear as a circular stone added to a ring’s flat plane. Through his work at Hoshour’s firm, Chavez was also exposed to contemporary art by artists such as Mark Rothko, Joan Miro and Piet Mondrian. Their influence can be seen especially in Chavez’s color choices. The patterns in stonework are often reminiscent of Mondrian’s colorations. His bolo tie pendants could be compared to a painter’s palette since the ornaments serve as a platform for design and color balance. Generally, these designs are abstracted geometrics, but at times one can detect the shape of a face or the hint of an eye. Some of Chavez’s creations directly reflect nature. The best examples are his butterfly brooches, which can also be worn as pendants. With great skill, Chavez creates complex stone mosaics in the butterfly wings, or simply carves stones to form the wings, adding incised lines to delineate patterns and creases on the wing’s surface. Often, he carefully carves contrasting stones for use as butterfly bodies and heads. BRACELET of black jade, coral, dolomite, and silver, 3.0 centimeters wide, 2010. Private Collection. 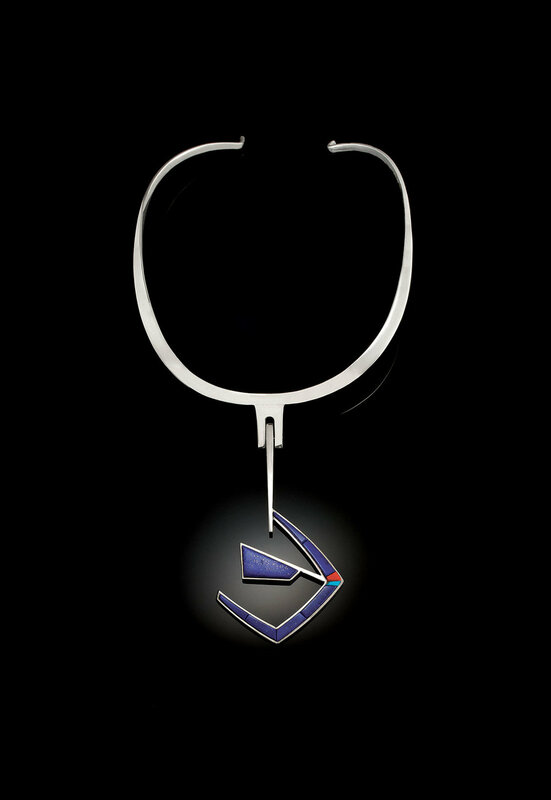 Chavez was also influenced by the economy of Scandinavian designs and he strives toward uninterrupted lines—A clasp might be designed to look like other sections in a necklace or bracelet; or alternately, pendants are attached to the fronts of necklaces and, in the process, also serve as the clasp. This meticulous geometry has influenced placements in exhibitions. When his jewelry was included in the Albuquerque Museum’s inaugural exhibition, “One Space, Three Visions” in 1979, the curator included his jewelry in the contemporary rather than the Native American section. Chavez is perhaps best known for the complex inlay shown in his bracelets. Since he cuts and shapes each stone by hand, his application of the stones to bracelet bands best exemplifies his mastery of blending shape, color and design. The stones are perfectly cut, often in trapezoid forms that match seamlessly. Sometimes Chavez adds thin gold bars as accents to the inlay while at other times he may choose turquoise or coral for his accents. One of Chavez’s first uses of Siberian green jade was for a bracelet made in 1996: the emerald-green jade stones, some of which have black inclusions, drew further attention to his capacity for detail and it has become a signature design. 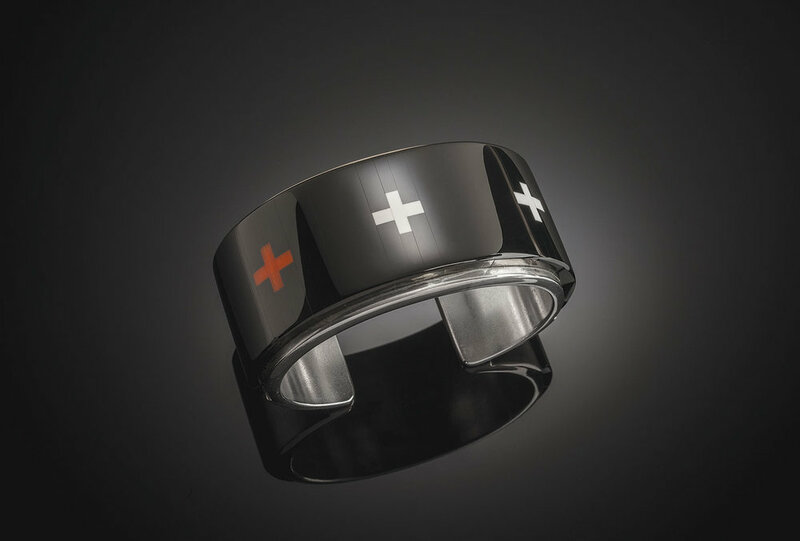 Another significant bracelet design represents his great accomplishments in stone polishing. It consists of a highly polished black jade plane with inset cardinal points in red coral or white dolomite. The surfaces are so perfectly polished that it is almost impossible to see the seams of the stones without magnification. Chavez undertakes every step of jewelrymaking without the aid of assistants. 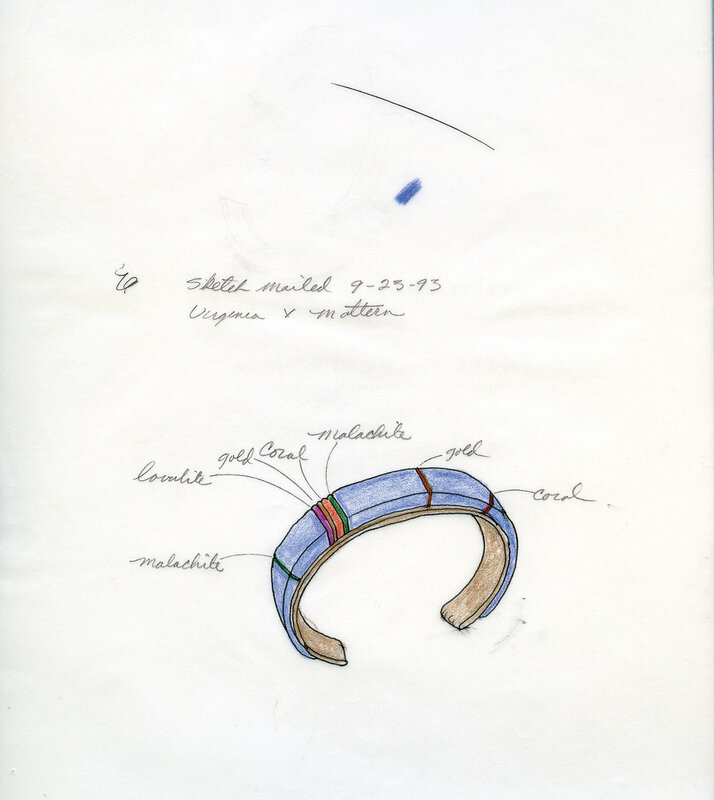 In 1997, when the Heard Museum was preparing a Southwestern jewelry exhibition, Chavez submitted a handwritten artist statement, which said, “From raw materials to finished product, I’m the sole maker of my jewelry. Each piece coming out of my studio has a part of me reflected in it. Any aspect of my jewelry making involves designing, fabricating, the grinding of metal and stones, the polishing and the finish applied to a piece. As difficult as it gets sometimes, I’ll never delegate any part of the work to an assistant.” Chavez has kept true to that statement. Because he is involved in every step, he may produce a small number of quality works annually. COLLABORATIVE BELT BY RICHARD CHAVEZ AND JARED CHAVEZ of black jade, coral, turquoise, and silver, 88.9 centimeters long, buckle measures 7.0 x 7.0 centimeters, 2012. Private Collection. In recent years, Chavez has collaborated with his son Jared (born 1982). Jared showed an inclination for art at an early age and an interest in jewelry design and fabrication while still a teenager. His parents encouraged him to attend college and after completing his Bachelor of Arts in studio art, with a focus in digital art and printmaking at Georgetown University, Jared returned to San Felipe and began to make jewelry on his own. The two men share a studio in San Felipe adjacent to the family home. While Richard emphasizes lapidary work, Jared has focused on metalsmithing. In 2011 they collaborated for the first time on a necklace that featured Jared’s metalwork and Richard’s lapidary work. They have undertaken several collaborations since. 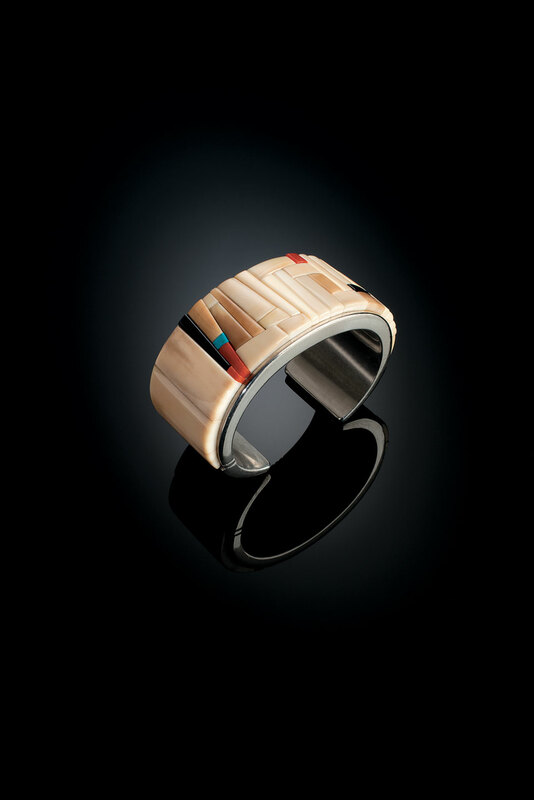 For more than forty years, Richard Chavez has created masterful jewelry with complex inlay and striking color patterns that reflect his architectural sensibilities. As his work has evolved, he has perfected his techniques while his designs have continued to delight and intrigue all who view them. Chalker, Kari, ed. Totems to Turquoise: Native North American Jewelry Arts of the Northwest and Southwest. New York: Harry N. Abrams, Inc., 2004. Cirillo, Dexter. Southwestern Indian Jewelry. New York: Abbeville Press, 1992. —. Southwestern Indian Jewelry: Crafting New Traditions. New York: Rizzoli, 2008. Pardue, Diana F. The Cutting Edge: Contemporary Southwestern Jewelry and Metalwork. Phoenix: Heard Museum, 1997. —. Contemporary Southwestern Jewelry. Salt Lake City: Gibbs Smith, 2007. —. Symmetry in Stone: The Jewelry of Richard I. Chavez. Phoenix: Heard Museum, 2017. “Symmetry in Stone: The Jewelry of Richard I. Chavez” showed February 2 - August 5, 2018 at the Heard Museum, 2301 N. Central Ave., Phoenix, Arizona 85004. Visit their website at www.heard.org. Diana F. Pardue is Chief Curator at the Heard Museum in Phoenix. Her interest in jewelry has led her to curate several exhibitions as well as to write articles and books about the topic, which include Contemporary Southwestern Jewelry; Shared Images: The Innovative Jewelry of Yazzie Johnson and Gail Bird; Native American Bolo Ties: Vintage and Contemporary Artistry (with Norman Sandfield); Awa Tsireh: Pueblo Painter and Metalsmith (with Norman Sandfield); and Symmetry in Stone: The Jewelry of Richard I. Chavez. 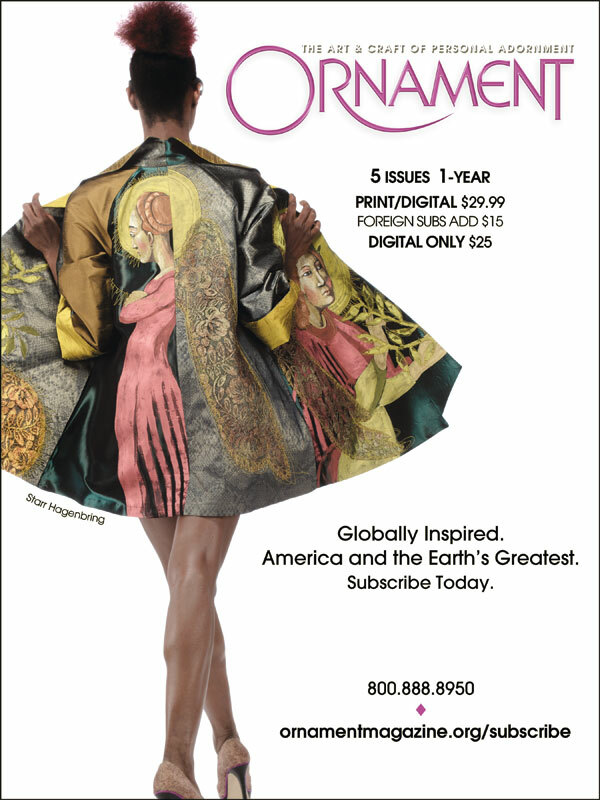 It is the fine lapidary skill of Chavez and start-to-finish process that Pardue investigates in her contribution to this issue.